After breaking a few Houdinis I realized it was time to investigate a more reliable alternative. Friends I trust to know recommended Screwpull/Le Creuset. This works great. I highly recommend it. I'm hard on wine openers and eventually wore mine out, so I upgraded to the metal version. It is exorbitant, but well worth the price, if you need an industrial strength wine opener. It has a 10 year warranty. My only complaint would be the plastic defoiler that comes with it. I broke it and replaced it with this beauty. It feels good in the hand and does a great job cutting foil. I also have a defoiler that I don't need to worry about losing. I take it on picnics and when traveling. If it breaks, $12 to Amazon and it shows up wherever I am two days later. I wanted to like the Vacu Vin, but could never figure it out. It looks cool, I'll give it that. We were joined by our friends for the fourth tasting of Santa Cruz Mountains Pinots under $30. This has been a Herculean effort. I appreciate everyone sticking with it. The forecast was for showers, so we delayed a couple of hours and moved the tasting inside. It was a little tight, but we made it work. In the end the weather was nice and sunny, but we nixed the audible to move outside because there weren't enough hours of daylight and it would quickly turn a little nippy. As we rearranged the living room, we realized we could fit one more table together into the big table. Sue dashed to Target to pick one up. Food prep was off by 30 minutes, but otherwise it resulted in more room for all. 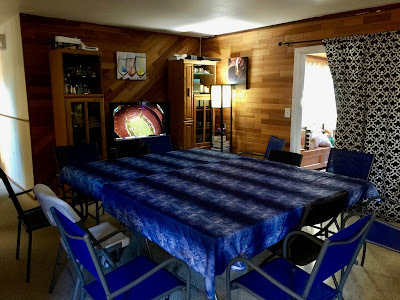 We selected and randomized at 4:30 before our guests arrived. The Nebraska game started at four, so I only got to watch a quarter before guests started to arrive. Score updates kept me on the edge of my seat until finally disappointing. Even though they didn't win, it was a great game overall. We started with a fantastic bottle of Patz & Hall, Hyde Chardonnay. I really enjoyed it. 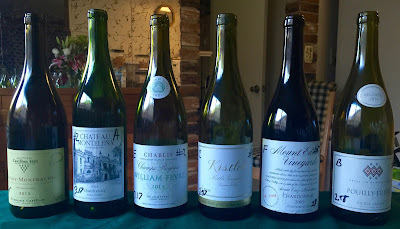 Sue thinks I've been getting more and more into Chards; I think we've been tasting better and better Chards. Shelves of the stuff prove one of us right. After declaring a strict no politics policy, we started tasting. We enjoyed meats, cheeses, and fruit in addition to a treat of bacon wrapped potatoes. F - 2011 Davine Cellars, Santa Cruz Mountains came in first place with an average of 3.53. D - 2010 Mun's Estate, Santa Cruz Mountains came in second place with an average of 3.40. B - 2010 Burrell School Estate, Santa Cruz Mountains came in third place with an average of 3.22. C - 2012 Silvertip, Estate, Santa Cruz Mountains came in fourth place with an average of 3.21. A - 2012 Perrucci Family Vineyard, Santa Cruz Mountains came in last place with an average of 3.08. A couple of months ago we were invited by Dom and Marie-Anne to try out Pacific Catch in Dublin with Bob and Carolynn. 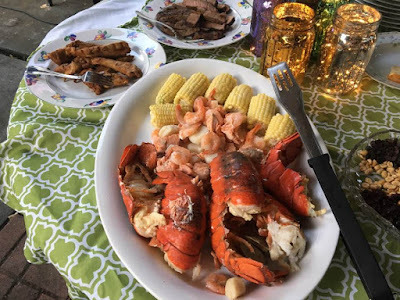 During our dinner conversation it came up that Marie-Anne's father thought that while California did a great job on reds, it had gotten whites all wrong. I asked if she had ever heard of the Judgment of Paris. She had not, so we planned this tasting. Maria-Anne generously supplied all the French wines. I supplied the Californian wines. I found all the ones we used at K&L. After I purchased the Chateau Montelena, I read an article that detailed how the original wine maker of the Chateau Montelena had moved on to his own winery, Grgich Hills Estate. Further research revealed that he made a commemorative wine. I picked up one of these as well, but decided to stay with my original purchase. We'll enjoy this special bottle at a future date. 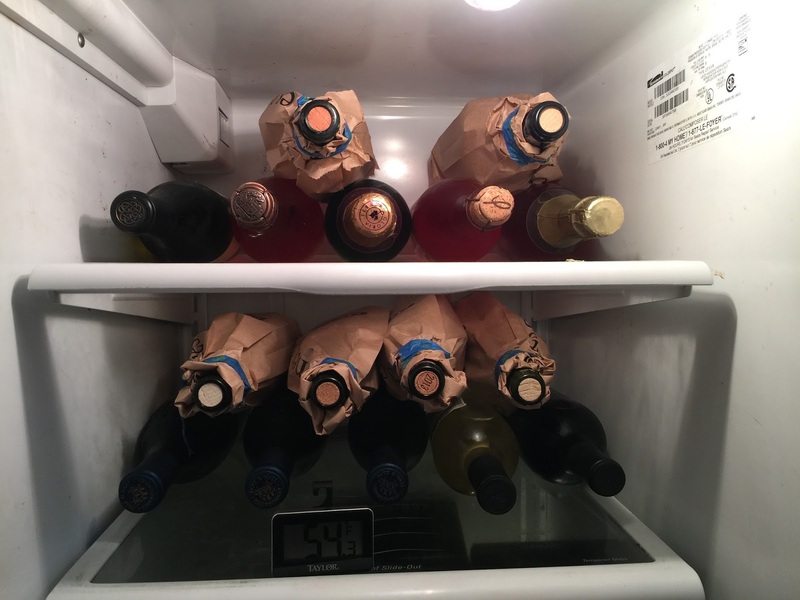 Dom brought in the wines to work days before, so that the temperature of all the wines would be the same when served. 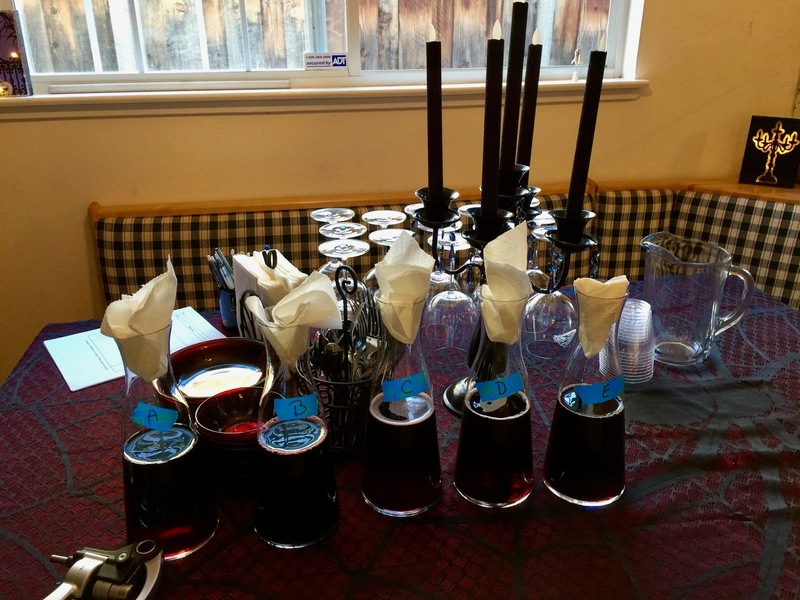 We delayed randomizing until everyone arrived due to concerns about warming the wines, but I was able to prep the decanters and bottles. 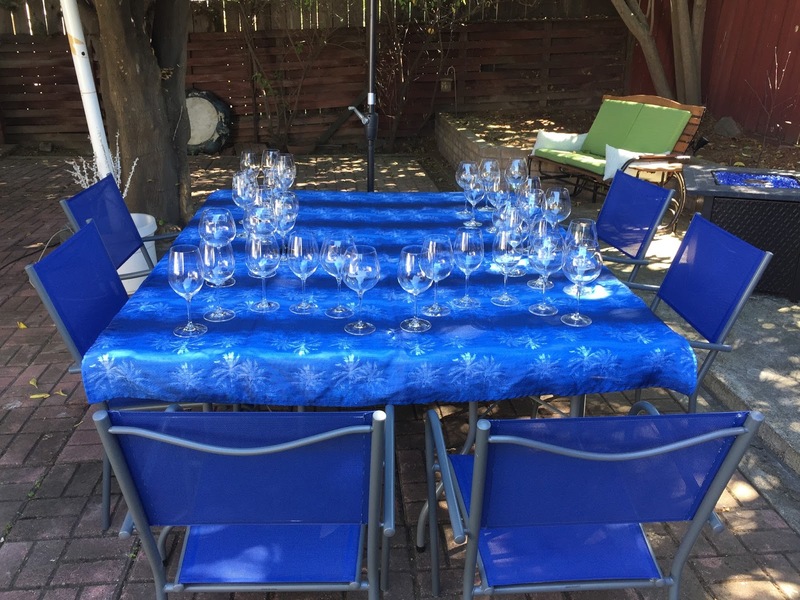 Since we were only six we were able to have a glass for each wine. I was worried the wine would warm, which it did, but Sue found a basket that held two decanters with ice quite nicely. We started with a lovely glass of Veuve Clicquot. 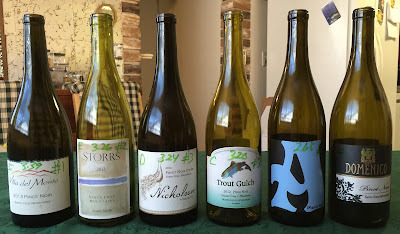 We randomized the wines and had a wonderful time tasting and talking. We tasted a lot of great wines. D - 2013 Francios Carillon, Puligny-Montrachet came in first place with an average of 3.25. A - 2013 Chateau Montelena, Napa Valley tied for second place with an average of 3.17. It cost $40. E - 2014 William Fevre, Chablis tied for second place with an average of 3.17. C - 2009 Kistler Vineyards, Kistler Vineyard, Sonoma Valley came in fourth place with an average of 2.97. It cost $125. F - 2009 Mount Eden Vineyards, Estate, Santa Cruz Mountains came in fifth place with an average of 2.92. It cost $80. B - 2014 Grand Vin De Bourgogne, Pouilly-Fuisse came in last place with an average of 2.58. Bob told of of a co-worker from the past, Jeff, who would always say "There's no such thing as a bad Pouilly-Fuisse." My experience is limited, but so far I agree! The French wines averaged a 3.00. The American wines averaged 3.02. History did not repeat itself, but we all enjoyed tasting some excellent wines. After the tasting Sue treated us with a wonderful New England Clam Bake, with a side of steak and chicken for non seafood lovers. 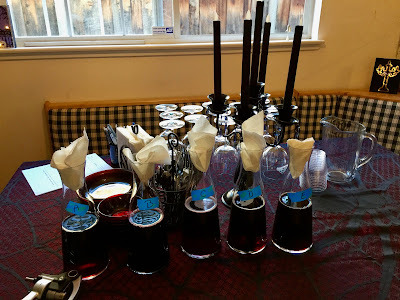 At my 45th birthday party we tasted some Cabs. Bob generously brought some Cabs he said we didn't have to wait to drink: A 1984 Duckhorn Vineyards and 1986 Caymus Vineyards. Wow! We didn't get to them that night. I put them away for another day. 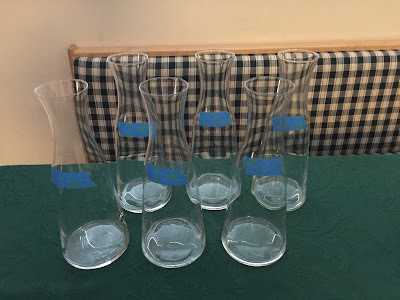 I brought them out, we added some more bottles, and tasted. At one point a grapefruit trampolined off the umbrella right pat Bob's head. A - 2013 Dreaming Tree, California came in first place with an average of 2.92. It cost $15. John brought this. The reviews were good. Apparently the winery has some connection with Dave Matthews. B - 2012 Picchetti, Bellicciti Vineyard, Santa Clara Valley came in second place with an average of 2.88. It cost $29. F - 2007 Burrell School Vineyards, Dean's List, Luchessi Vineyard, Santa Cruz Mountains came in third place with an average of 2.62. It cost $39. Bob brought this. D - 2011 Dariush, Napa Valley came in fourth place with an average of 2.28. It cost $95. C - 1984 Duckhorn Vineyards, Napa Valley came in fifth place with an average of 2.17. E - 1986 Caymus Vineyards, Napa Valley came in last place with an average of 1.67. 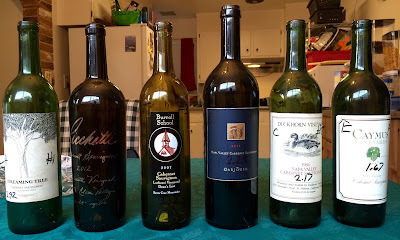 Unfortunately the older wines were well past their primes and didn't show well, but we had a good time. 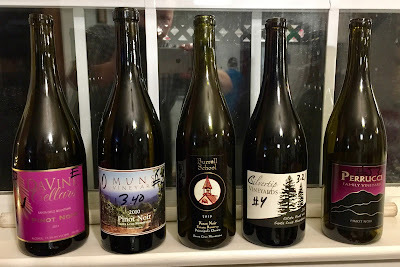 We were joined by our friends to taste the third batch of 6 random Santa Cruz Mountains Pinots under $30 on a cool Spring night that was close enough to my birthday to elevate the event. 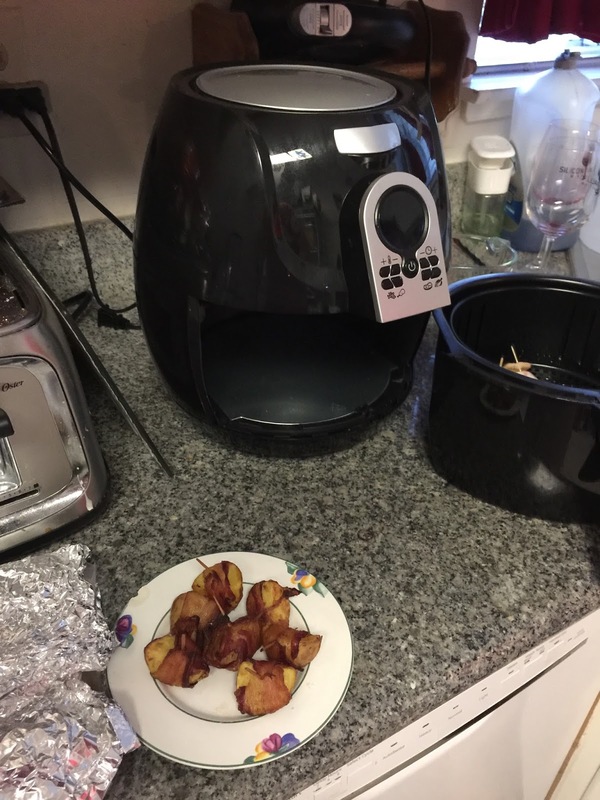 Days before Sue had performed a successful trial run of bacon wrapped potatoes in her new air fryer. 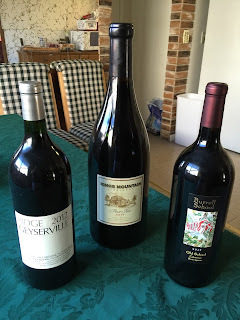 I brought out some of my big bottles to celebrate my birthday. 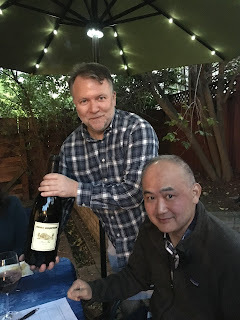 We warmed our taste buds with some yummy whites: A 2013 Dariush Chardonnay, a 2012 Thomas Fogarty Chardonnay, and a 2014 Picchetti White Pavone. Sue served up all my favorites: Bacon wrapped potatoes, pot stickers, cheese and charcuterie. We all enjoyed the bites as we tasted. Occasionally some screamed of Trump and Obama. Our neighbors enjoyed our renditions of the Gambler and more. All the wines we tasted were really good. Ted mentioned many times that he thought this was the best batch yet. 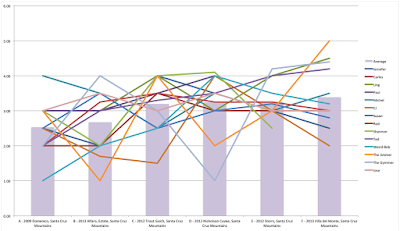 F - 2013 Villa del Monte, Santa Cruz Mountains came in first place with an average of 3.39. E - 2012 Storrs, Santa Cruz Mountains came in second place with an average of 3.26. 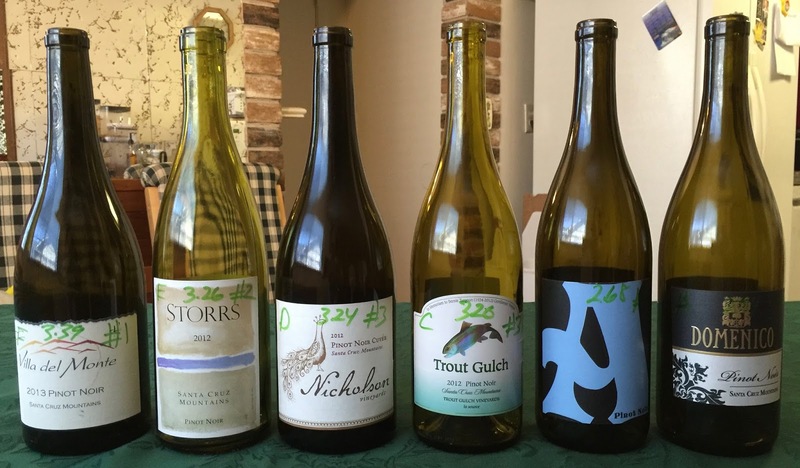 D - 2012 Nicholson, Cuvee, Santa Cruz Mountains came in third place with an average of 3.24. C - 2012 Trout Gulch, Santa Cruz Mountains came in fourth place with an average of 3.20. B - 2013 Alfaro, Estate, Santa Cruz Mountains came in fifth place with an average of 2.68. 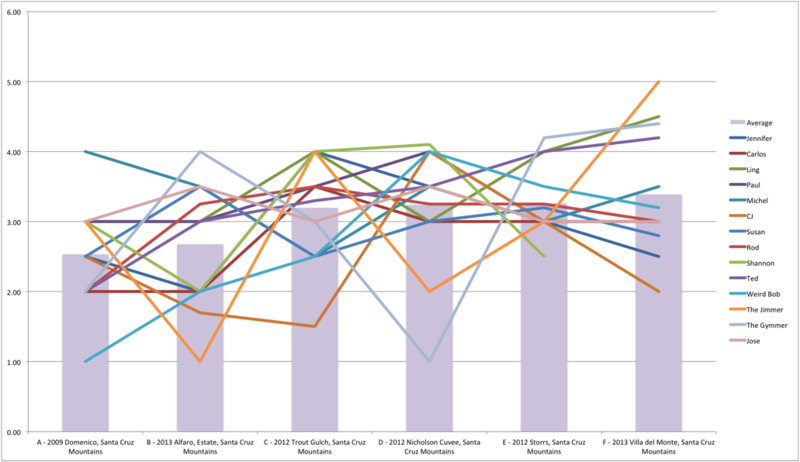 A - 2009 Domenico, Santa Cruz Mountains came in sixth place with an average of 2.54. After the tasting we enjoyed some special treats. 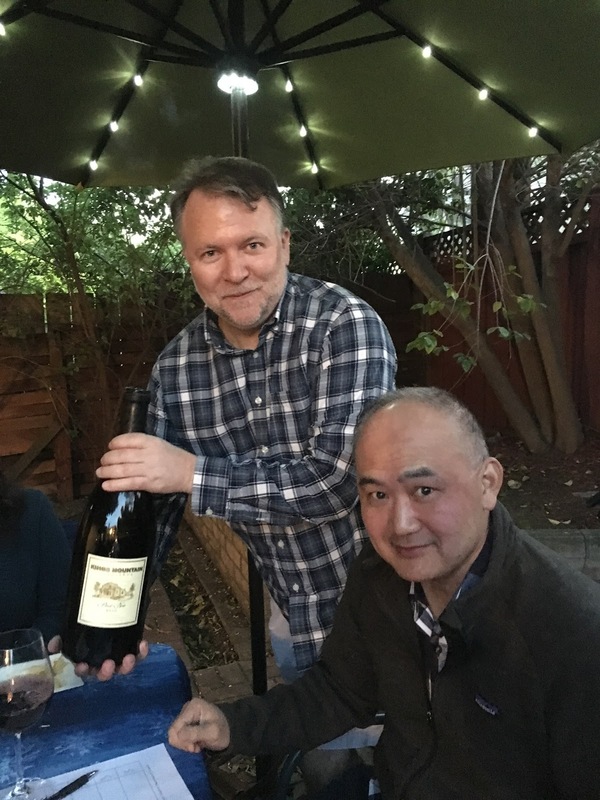 We enjoyed the double magnum of 2010 Kings Mountain Pinot from last year's Silicon Valley Wine Auction. This was the first double magnum I have ever served. Pouring from a double magnum is an incredible feeling. The bottle is huge! Magnums are fun, but they do not compare. The Kings Mountain was delicious! I'll be looking to win this again, at this years event. We enjoyed a 1999 Trout Gulch, that Gerald Turgeon had given us to throw into a blind tasting as a ringer. What an incredible gift to share with us! Thank you Gerry. I've never tasted something so old. 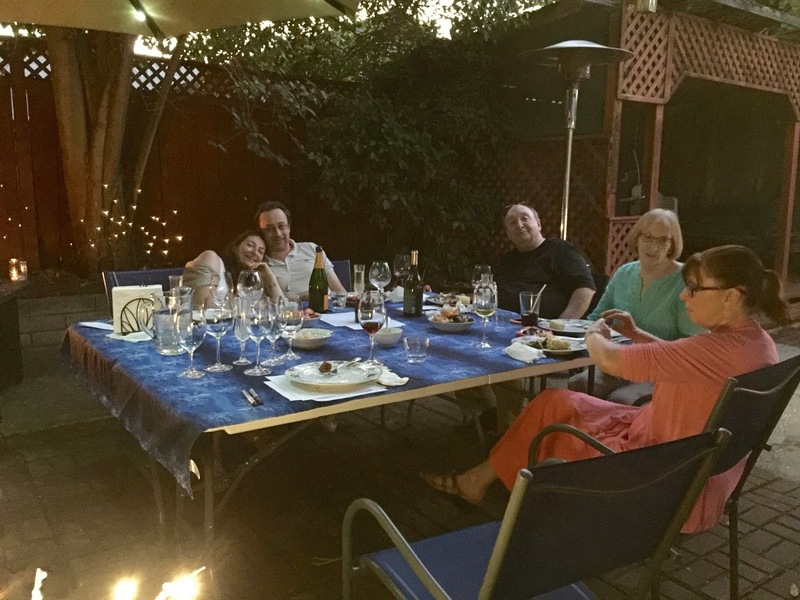 Sue rounded out the night with Fred's steak, salad, other fixins, and some cake. The results are in for the 2016 SF Chronicle Wine Competition. 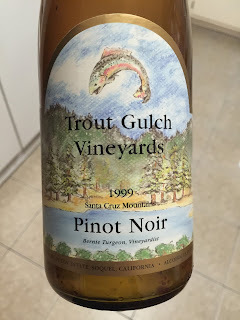 Congratulations to the 26 Santa Cruz Mountains Pinots! I'll ponder which should be tasted.